Piotr Sułkowski is a theoretical physicist, an associate professor and a leader of a research group at the Faculty of Physics, University of Warsaw (Poland), and a visiting faculty at the California Institute of Technology (USA). His research interests include mathematical physics, quantum field theory and string theory, and occasionally biophysics. He is also involved is science popularization. In the autumn 2018 we have several openings for postdocs and PhD students, in ERC and Team grants – for details see below ("Positions available"). Good summer news: "Team" grant for research on "Random matrix models" from the Foundation for Polish Science! Ile wymiarów ma Wszechświat? Czym są czasoprzestrzeń, kwanty, struny? O tym w Kawiarni Naukowej Festiwalu Nauki (19 lutego 2018) oraz na wykładzie Polskiego Towarzystwa Fizycznego w Szczecinie (11 czerwca 2018). "Topological recursion" [pdf] – a snapshot of modern mathematics from Oberwolfach (Imaginary). Meetings not to be missed: "Quantum knot homology and supersymmetric gauge theories" (Aspen Center for Physics, March 4-10, 2018), "Categorification in mathematical physics" (Simons Center for Geometry and Physics, Stony Brook, USA, April 9-13, 2018), "Quantum fields, knots, and strings" (University of Warsaw, September 25-28, 2018) and "Quantum knot invariants and supersymmetric gauge theories" (Kavli Institute for Theoretical Physics, University of California Santa Barbara, USA, November 5 – December 14, 2018). Spotkanie z Hubertem Czerepokiem i Piotrem Sułkowskim, w ramach tegorocznej edycji projektu Synchronizacja Fundacji "Bęc Zmiana" oraz wystawy ZAPAL SIĘ!, odbędzie się 22 września 2014 r. o godz. 18:00 w Parku Rzeźby wokół Królikarni. Zapraszamy! We have launched the "KnotProt: a database of proteins with knots and slipknots"; the accompanying paper has been published in Nucl. Acids. Res. A new webpage for the project Zapytaj fizyka has just been launched. This is a science popularization project in which we answer intriguing physics questions asked by non-experts. As part of the project we will also organize a series of lectures by famous physicists and science advocates. First lectures are given by prof. Michał Heller (February 26th), dr Stanisław Bajtlik (March 12th), prof. Ryszard Horodecki (April 17th). The lectrues are advertised, among the others in buses, trams, and trains in Warsaw transportation system - be alert! In January 2015 Prof. Neil Lambert became an affiliated professor at the Faculty of Physics, University of Warsaw; he will be our guest for the next few years. This spring he will give a course on string theory and M-theory - everyone is welcome to attend! 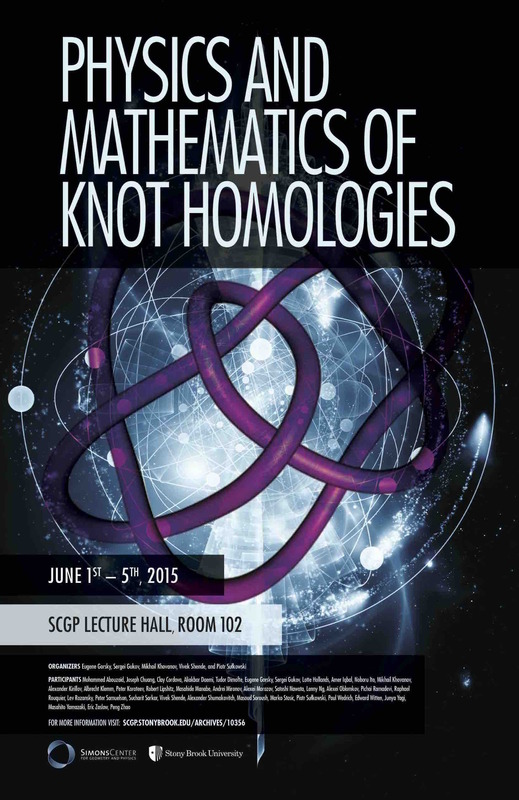 This week (June 1-5, 2015) the Mathematics and physics of knot homologies conference is taking place, summarizing the whole semester program on these and related topics at the Simons Center for Geometry and Physics. A promotional movie presenting University of Warsaw has just been released. Zapytaj fizyka shares a few out of its 100 seconds! Our research and science popularization activites have been awarded by the Award of the City of Warsaw, which is granted to people or teams of people who are of special merit to the City; the awards ceremony took place at the Royal Castle on July 31st, 2015. Congratulations to Miłosz Panfil, who was awarded (on June 22, 2015) the Fuga postdoctoral grant from the National Science Center and will join our group soon! Prime Minister Prizes 2015 (and a list of laureates). Our Advanced School on Topological Quantum Field Theory (Warsaw, December 7-9, 2015) has just been announced! Now we know: quantum curves are singular vectors and BPS spectra can be sequenced! Helder Larraguivel and Petr Vasko joined our group this autumn (2016)! Prof. Tomasz Taylor will spend the academic year 2016/2017 at our department as a Fulbright visiting professor. Among other activities he will give a lecture course entitled "Amplitudes" - everyone is encouraged to learn how to compute them! W radiu TokFM o konferencji "Światy równoległe", działalności "Zapytaj fizyka", i fizyce współczesnej. Polish Academy of Sciences Stefan Pieńkowski Prize. Science popularization prize for Piotr Sułkowski and the Faculty of Physics. Rozmowa z okazji 25-lecia FNP: "Ważne fizyków rozmowy"
August 2017: Polish Physical Society – science popularization prize and Ernst medal. May 2017: Paweł Ciosmak and Jakub Jankowski won Preludium and Sonata grants from the National Science Centre to conduct research in our group. Congratulations! On September 13, 2017, Piotr Kucharski defended his PhD thesis. This summer also Paweł Smoliński defended MSc. thesis, and Tomasz Linowski and Artur Strąg obtained BSc. degrees. Congratulations! This Fall (2017) members of our group are conquering the world with new postdoc positions. Piotr Kucharski, after a year in Uppsala University, will move to the California Institute of Technology (under Mobilność Plus grant). Masahide Manabe is moving to the Max Planck Institute for Mathematics in Bonn, and Junya Yagi to the Perimeter Institute. Congratulations! Our colloquium "The Algebra & Geometry of Modern Physics" this year will be devoted to supersymmetry and index theorems. Everyone is welcome! A two-year postdoctoral position (starting any time soon) is available within the project "Random matrix models: from biomolecules to topological recursions", in the “Team” program funded by the Foundation for Polish Science under the Smart Growth Operational Programme. This is an interdisciplinary project, aiming to develop the theory of matrix models and topological recursions, and to employ such tools to formulate new topological and combinatorial characteristics of biomolecules. The tasks of a postdoctoral scholar will include developing measures of complexity of biomolecules and using them to characterize and to classify RNA and protein chains; setting up internet tools for such an analysis; supporting design of RNA and RNA-protein nanostructures, also in collaboration with our partner experimental laboratory at the Aarhus University. An experience of a candidate in (theoretical) biophysics and various programming techniques will be an asset. A successful candidate should hold the PhD degree not longer than 4 years. Application documents should include a formal application letter for the position (with scanned signature), “Information on the processing of personal data” (available at http://bsp.adm.uw.edu.pl/bsp/druki-i-formularze/), a curriculum vitae, a list of publications, a statement of research interests, two letters of recommendation, and a PhD diploma (or a formal confirmation of PhD degree). All documents, preferably in pdf format, should be sent by e-mail to psulkows [at] fuw.edu.pl (with "Team – postdoc application" in the subject line). Primary consideration will be given to applications received by February 4th, 2019. Candidates may also be invited for an interview in the second round of applications. All inquiries in regards to this announcement should be sent to Piotr Sułkowski (psulkows [at] fuw.edu.pl).